The 1st Annual MTFB Food Show | Favorite Foods, Inc. It has been almost a year since Mid-Town Beef Co. of Fitchburg, MA joined forces with Favorite Foods and became Mid-Town Favorite Beef, which means it’s time to hold their very own food show! Favorite Foods has been hosting a food show for years now and it has become our most popular event, so we’ve taken the same concept and put our hearts into setting up a successful event for the acquired Mid-Town Favorite Beef and their loyal customers. 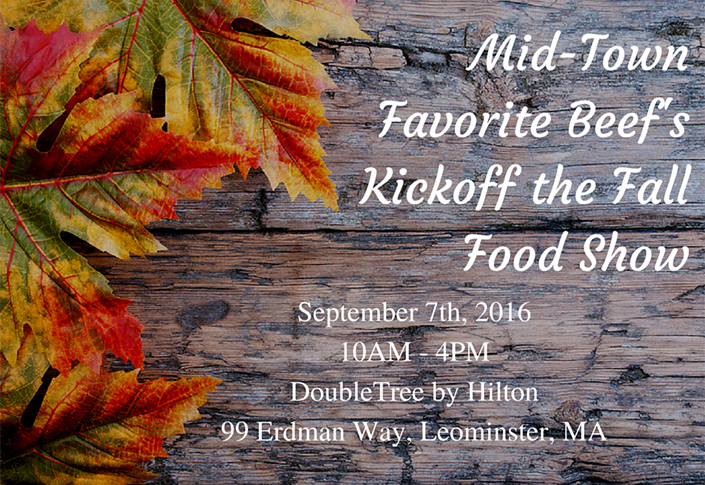 The first ever Mid-Town Favorite Beef food show is going to be on Wednesday, September 7th, 2016 at the DoubleTree by Hilton in Leominster, MA. It’s still summer now, but being after Labor Day, which is the unofficial end to summer, we are turning this food show into a fall kickoff party. This show is being put into place to gather together customers that we’ve acquired since the merge of the two companies so we can show them all the great products that Mid-Town now offers through Favorite Foods. With the two companies coming together, MTFB’s product line has expanded to over 4,000 items available to their customers! If you are a restaurant owner, manager, chef, or run a foodservice operation in some type of way in the greater Fitchburg/Leominster area, this show is for you. We are looking forward to seeing you there!